Losing excessive hair from any part of the body; especially the scalp is called hair loss. Losing strands of hair when you are combing is considered normal and per day, you can lose from 75 to 100 strands. Hair loss is also commonly known as alopecia or baldness. Losing hair in excess should never be taken lightly. There are many types of alopecia and many causes as well. Knowing and understanding the kind of hair loss you have will help you find the right treatment. This is hair loss that is triggered by an immune system reaction. The hair follicles are targeted by an immunity dysfunction which leads to hair loss and poor hair growth. Studies have shown that this form of alopecia can be caused by autoimmune disorders such as lupus, rheumatoid arthritis and many others. Genetic predisposition for this type of hair loss has also been observed. This is one of the most common types of hair loss in males. However, it can affect women as well. It is also referred to as male pattern baldness. Thinning and hair loss starts from the temples as hair is lost in the entire crown of the head gradually. With time, the person affected may become totally bald. This is hair loss that is triggered by tension or pulling of hair from the follicles. Tight braiding is the most common cause of this problem. If the hair experiences tension over a long period of time, the hair will break and can even be uprooted from the follicle root. Tight braiding is not the only cause because cosmetic surgeries such as facelifts can have the same effect. Total hair loss from every part of the body is called alopecia universalis. This means that even eyelashes, brows and even nose hairs will be affected. 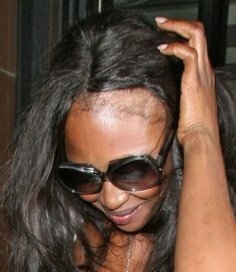 This is considered one of the most severe cases of hair loss. This is an autoimmune hair loss condition that sees people affected lose all their scalp hair. Hair may be lost in a very short time or it could be lost gradually starting with small patches on the scalp. Hair loss occurs on the scalp only. This is a form of traction alopecia that affects the crown of the head. This is caused by styling hair in a tight bundle for a very long time. Those who are into ballet dancing for example have to style their hair this way. To this end, this form of hair loss might be witnessed. Hair loss that takes place in a wave-like pattern on the scalp is called Ophiasis. This is a form of alopecia areata. When your hair follicles are not growing properly, they might skip various growth stages and the end stage is weak hair. This hair loss is called telogen effluvium. This type if hair loss is usually triggered by an underlying disease, stress or even certain medication. This type of alopecia can affect men, women and even children. This is a lack of hair rather than a hair loss issue. When one is affected by hypotrichosis, it means that no hair is growing in the first place. This is a compulsive obsessive disorder that leads one to pull their own hair. After some time, the hair loss will be very visible and even severe. Treating the underlying psychological disorders is the key to solving the problem. Hair loss is generally more common in men than in women. Understanding the causes of hair loss in men, women and children is the key to finding a solution. Below is a look at the general causes of alopecia in men, women and children. If your parents or relatives have grappled with hair loss, chances are that it might run in your family. Genes play an important role in making certain people more predisposed to certain kinds of alopecia. Due to genetics, you can suffer male pattern baldness and even female pattern baldness. This kind of hair loss is also called androgenetic alopecia. This cause cannot be prevented but it can be managed. Any trauma that disrupts the growth cycle of the hair follicles can trigger hair loss. Examples of physical trauma could be an accident, a surgical procedure and even an illness. The type of hair loss that is likely to be witnessed from trauma is telogen effluvium. It causes premature growth of hair leading to loss. For you to enjoy healthy hair growth, you need to nourish your body with high quality protein. When there is a deficiency, the body will not make hair growth a priority; and this will lead to hair thinning. If you are taking a vitamin A supplement, it is critical that you do not go overboard. Too much will trigger hair loss. The recommended daily intake for vitamin A is about 5,000 IU (International Units) for children above the age of four and in adults. Some supplements will contain up to 10,000 IU. For both men and women, fluctuating hormones can be a source of potential hair loss. In women, pregnancy disturbs or alters how the body was functioning and this change can lead to hair thinning. As a matter of fact, giving birth has been seen to have a traumatic effect on women; leading to more hair loss. Experts say that hair loss in pregnancy occurs after childbirth rather than during the gestation period. Hormones can also change when you go on birth control or when you stop taking birth control. Menopause is another cause of hormonal imbalance which can impact hair growth negatively. Thyroid disorders also cause hormonal problems that lead to hair loss. Poly-cystic ovarian syndrome is another issue that triggers hormonal problems paving way to alopecia. When you are lacking enough iron in your body, you are considered anemic. This is a common cause of hair loss. About 10% of all women in the reproductive age are anemic. With high quality iron supplements, this cause is easy to treat and reverse. Losing weight too quickly is bad for your health. In fact, it is very bad for hair growth. This is a physical trauma that can alter the growth process leading to hair thinning. Sudden or dramatic loss of weight can be caused by conditions such as anorexia or bulimia. It can also be caused by drastic diet changes. This problem can have a ripple effect because with a new limited diet, your nutritional needs could be compromised. Deficiencies in vitamins, iron and even minerals will propel hair loss further. It is common knowledge that chemotherapy seeks to discourage cancer cells. These fast growing cells are destroyed and in the process, other quickly-dividing cells like hair are also destroyed. After the treatment is over, hair should grow back. Other medications that have been seen to cause hair loss include antidepressants, blood thinners and non-steroidal anti-inflammatory drugs. Abusing anabolic steroids will also trigger hair loss. This is an impulse control disorder that leads people to pull or pluck out their hair a strand at a time. This condition is more common in women than in men. To tackle this problem, psychological evaluation is necessary. Antidepressants and therapy to correct the behavior could be prescribed. As you age, you are more likely to lose hair. In this regard, hair loss is more common for men and women who are over the age of 50 years. Other causes are over styling, heat styling or wearing styles that cause traction alopecia. Use of certain unsuitable hair products can also trigger hair loss. A scalp infection called tinea capitis is a common cause of hair loss in children. This fungal infection is contagious and can be spread through the use of personal hair care items. Anti-fungal treatments will be prescribed for several weeks to provide some relief from the condition.